The All Purpose Gillette Styler razor trims evenly, shaves closely and edges precisely. The Styler has everything you need to achieve any facial hair style: Trim - Waterproof trimmer is complete with three exchangeable combs (2mm, 4mm, 6mm) for consistent length and contour adaptability; Shave - Gillette ProGlide razor blades for men, from the brand you trust, deliver a close and comfortable shave; Edge - Precision Trimmer creates crisp, defined lines and finishing touches. Powered by Braun-engineered technology, the Styler is waterproof and shower safe, letting you trim while you shower. The All Purpose Styler lets you easily master any style with one precision tool. 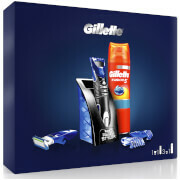 For incredible performance, shave with any Gillette Fusion5 men's razor blade cartridge. Good when 1st purchased. 1st trimmer gave up after couple of months, bought another one and the same thing happened. So, doubt if I could recommend. Brilliant. Using 3 yrs+. 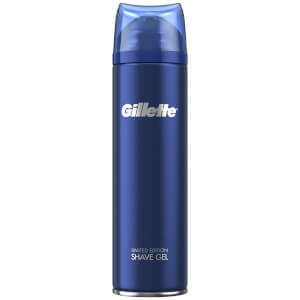 Versatile &waterproof .great value and it gives a great shave. Love it and will be getting another. Severely disappointed that you have to buy a complete new razor if the attachments break. Totally unacceptable and very poor customer service. Absolutely love this razor! Brilliant for keeping my beard tidy and looking sharp. Only downside is that I can't find any specific blades to fit when shopping. Brilliant. Only one flaw. It's only available in blue. More than one Proglide user in a household? All blue! You can imagine the ensuing chaos. Colour differentiation please?!? Gillette makes the best razors hands down. 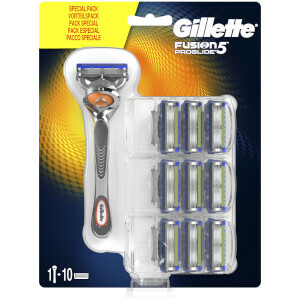 And the Fusion blades gives you the best 5 blades out there with the single blade for precision! Best Product i have ever used. I really like the razor. The only thing I miss is not having a case that holds the razor and extra blades or something that protects the blades like the little plastic thing .